A Snohomish County Sheriff’s Office cold case: Who Murdered Jody Loomis? 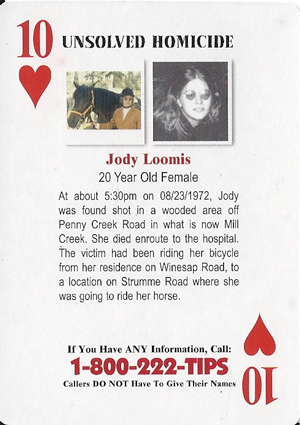 Jody Loomis is the Ten of Hearts in the Snohomish County Sheriff's Office cold case card deck. Editor's note: An arrest was made for this murder on April 10, 2019. Click here for more information: Arrest made in 1972 Jody Loomis homicide cold case. Mill Creek resident Chuck Wright gave the following discourse at the September 3, 2013, Mill Creek City Council meeting.